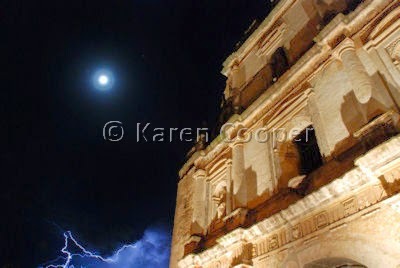 I got to Antigua, Guatemala (or La Antigua as most Guatemalans call it) late at night to a spectacular lightining display over the volcanoe. I thought it would make an interesting shot. Like life, nothing comes easy. I know this. I still get frustrated at myself. But I have to laugh as well. Standing in the middle of the street with my camera on a tripod, trying to dodge the traffic (both 4 wheeled and 2 footed) and catch the nanosecond flashes of lightening. It was a Friday night as well so some of the 2 footed traffic was a wee bit unsteady. Won't even admit how many shots I actually took. Guess my reactions are getting slow. Or it was really more fun to watch the display of dancing lights across the mist and low clouds. There are a lot of old buildings here. It used to be the capital of Guatemala way back when. In 1773 an earthquake destroyed most of this city and the capital was moved to Guatemala City. A lot of the destroyed buildings were never rebuilt and today make for some great photo ops. I love taking photos. It teaches me so much about life. You have to work for what you really want. A healthy dose of passion comes in handy as well. And of course a good sense of humour to giggle at yourself. In the end, you just learn to not really take yourself too seriously. A good laugh is much better. I wanted to take a minute to say thank you to eveyone who has left me such inspiring comments on the posts. They mean a great deal to me. I'm sorry I haven't been able to answer each of you individually as my internet time is limited at the moment. Thank you for sharing my wee journey with me, your comments and insights have inspired me to even better things, I hope. And that is what life is really all about. Great picture! Not being a professional photographer, I don't automatically think of how hard it is to get those perfect shots, but I guess like everything else in life, really good things take effort and time.